Mr. Dot is easy to please when it comes to food. As long as I make Turkey Curry Pot Pie every year, he’s a happy man. Actually, he seems to think the pie is a big deal and he thinks that we would get rich if I would sell it. I know that it’s kind of easy and I’m happy to share the recipe. I discovered the recipe in Sheila Lukins’s USA cookbook, which I bought when I returned to the USA after living in Israel for 14 years. 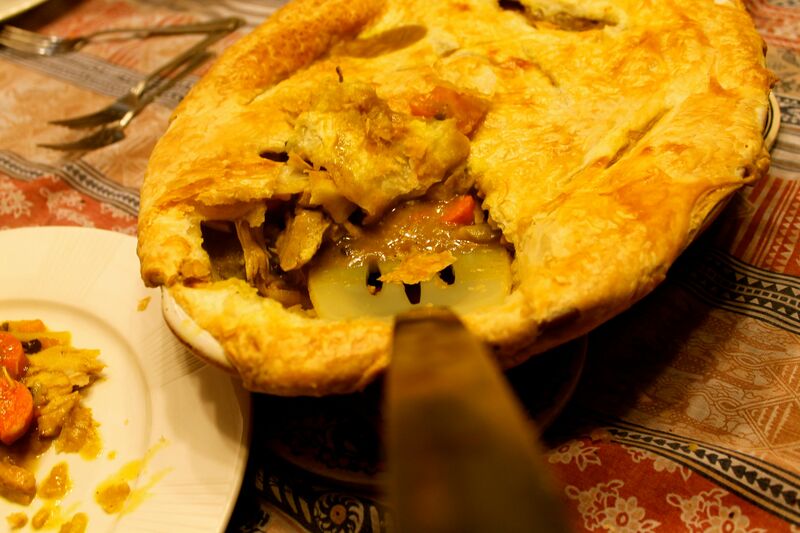 I don’t know if the curry pie can really be considered traditional US food but in any event, it has become a Thanksgiving weekend standard around here. On Thursday of Thanksgiving, I make a large enough turkey to have leftovers for the pie (and maybe a turkey sandwich or two). This year, I took the leftovers one step further. We had our pot pie on Sunday night after Thanksgiving, marking our Thanksgiving weekend as officially over. But I was left with puff pastry which I had defrosted and I’d only needed half the package for the pie. There’s nothing that Ms. Dot junior (aka my fearless photographer) loves more than something in puff pastry. For example, she loves “pigs in a blanket” and a local store sells hotdogs in puff pastry and she loves that version, too. In any event, I knew that if I made something in puff pastry, it would be a hit chez Dot. 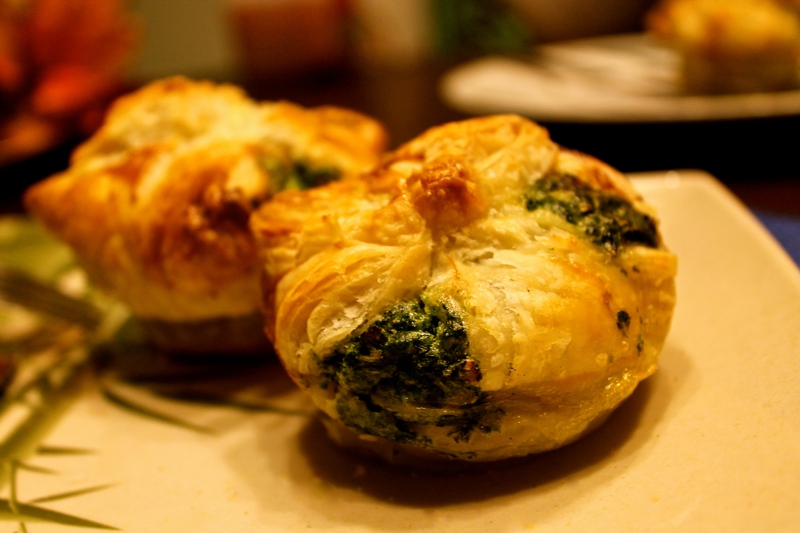 I wasn’t in the mood to fuss so I was thrilled when I came across a recipe that I only tinkered with a bit and came up with my fearless photographer’s new favorite: spinach puffs. I was surprised by how easy and how delicious they are. You could use them as an appetizer (they look beautiful for company) or eat a couple with salad for a meal, as we did. As the next round of holidays approaches, I think you’ll find that this ones a keeper. Cook spinach in microwave for 3 minutes. Add with leeks to food processor and pulse a few times until chopped. Add olive oil, dill and garlic to processor and pulse one more time. Season to taste with salt and pepper. Add 2eggs and feta a mix. Cut puff pastry into 3 equal strips. Cut each remaining strips into 3 squares for a total of 9. Spray muffin pan (I used silicone muffin pans) with nonstick spray. Place a square in each muffin cup, pressing into bottom and up sides and leaving corners pointing up. Divide filling among cups. Fold pastry over filling, pressing corners together to meet in center. Preheat oven to 400°F. Beat remaining egg to blend in a small bowl. Brush pastry with egg wash. Bake until pastry is golden brown and puffed, about 25 minutes. Transfer to a wire rack; let puffs cool in pan for 5 minutes, then remove and serve.